An Air Force veteran explains how we all got drafted into the American national security state. I spent four college years in the Reserve Officers’ Training Corps (ROTC) and then served twenty years in the US Air Force. In the military, especially in basic training, you have no privacy. The government owns you. You’re “government issue,” just another GI, a number on a dog tag that has your blood type and religion in case you need a transfusion or last rites. You get used to it. That sacrifice of individual privacy and personal autonomy is the price you pay for joining the military. Heck, I got a good career and a pension out of it, so don’t cry for me, America. But this country has changed a lot since I joined ROTC in 1981, was fingerprinted, typed for blood and otherwise poked and prodded. (I needed a medical waiver for myopia.) Nowadays, in Fortress America, every one of us is, in some sense, government issue in a surveillance state gone mad. 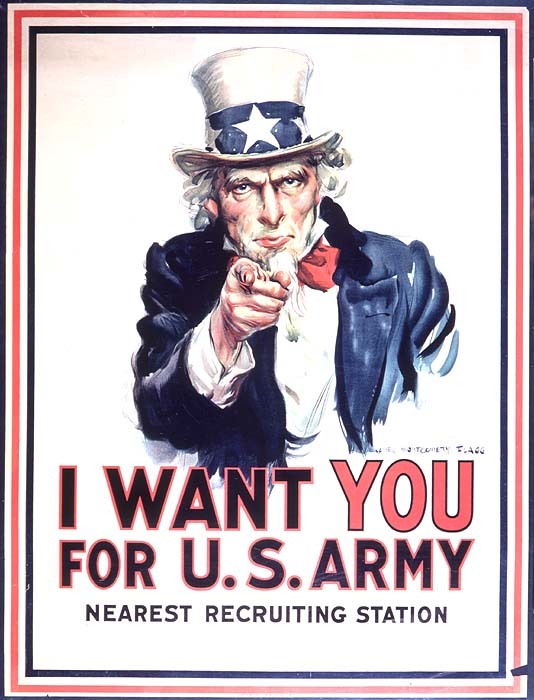 Unlike the recruiting poster of old, Uncle Sam doesn’t want you anymore—he already has you. You’ve been drafted into the American national security state. That much is evident from Edward Snowden’s revelations. Your email? It can be read. Your phone calls? Metadata about them is being gathered. Your smartphone? It’s a perfect tracking device if the government needs to find you. Your computer? Hackable and trackable. Your server? It’s at their service, not yours. Think of the irony. The Vietnam War generated an unruly citizen’s army that reflected an unruly and increasingly rebellious citizenry. That proved more than the US military and our ruling elites could take. So President Nixon ended the draft in 1973 and made America’s citizen-soldier ideal, an ideal that had persisted for two centuries, a thing of the past. The “all-volunteer military,” the professionals, were recruited or otherwise enticed to do the job for us. No muss, no fuss, and it’s been that way ever since. Plenty of war, but no need to be a “warrior,” unless you sign on the dotted line. It’s the new American way. If you’re bold, gaze out across the increasingly fortified and monitored borders we share with Canada and Mexico. (Remember when you could cross those borders with no hassle, not even a passport or ID card? I do.) Watch for those drones, home from the wars and already hovering in or soon to arrive in your local skies—ostensibly to fight crime. Pay due respect to your increasingly up-armored police forces with their automatic weapons, their special SWAT teams and converted MRAPs (mine-resistant ambush protected vehicles). These vintage Iraqi Freedom vehicles are now military surplus given away or sold on the cheap to local police departments. Be careful to observe their draconian orders for prison-like “lockdowns” of your neighborhood or city, essentially temporary declarations of martial law, all for your safety and security. I’ve been out of the military for nearly a decade, and yet I feel more militarized today than when I wore a uniform. 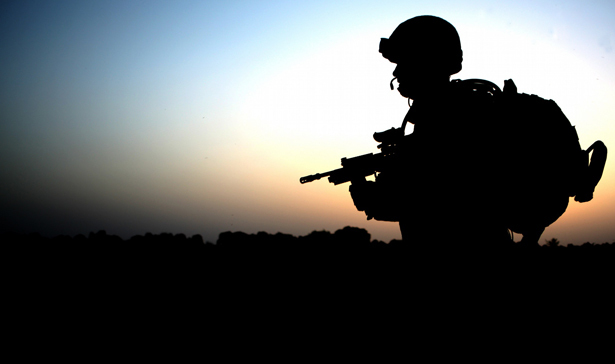 That feeling first came over me in 2007, during what was called the “Iraqi surge”—the sending of another 30,000 US troops into the quagmire that was our occupation of that country. It prompted my first article for TomDispatch. I was appalled by the way our civilian commander in chief, George W. Bush, hid behind the beribboned chest of his appointed surge commander, General David Petraeus, to justify his administration’s devolving war of choice in Iraq. It seemed like the eerie visual equivalent of turning traditional American military-civilian relationships upside down, of a president who had gone over to the military. And it worked. A cowed Congress meekly submitted to “King David” Petraeus and rushed to cheer his testimony in support of further American escalation in Iraq. Since then, it’s become a sartorial necessity for our presidents to don military flight jackets whenever they address our “warfighters” as a sign both of their “support” and of the militarization of the imperial presidency. (For comparison, try to imagine Matthew Brady taking a photo of “honest Abe” in the Civil War equivalent of a flight jacket!) It is now de rigueur for presidents to praise American troops as “the finest military in world history” or, as President Obama typically said to NBC’s Brian Williams in an interview from Normandy last week, “the greatest military in the world.” Even more hyperbolically, these same troops are celebrated across the country in the most vocal way possible as hardened “warriors” and benevolent freedom-bringers, simultaneously the goodest and the baddest of anyone on the planet—and all without including any of the ugly, as in the ugliness of war and killing. Perhaps that explains why I’ve seen military recruitment vans (sporting video game consoles) at the Little League World Series in Williamsport, Pennsylvania. Given that military service is so beneficent, why not get the country’s 12-year-old prospects hopped up on the prospect of joining the ranks? It wasn’t always so. I remember walking the streets of Worcester, Massachusetts, in my freshly pressed ROTC uniform in 1981. It was just six years after the Vietnam War ended in defeat and antiwar movies like Coming Home, The Deer Hunter and Apocalypse Now were still fresh in people’s minds. (First Blood and the Rambo “stab-in-the-back” myth wouldn’t come along for another year.) I was aware of people looking at me not with hostility, but with a certain indifference mixed occasionally with barely disguised disdain. It bothered me slightly, but even then I knew that a healthy distrust of large standing militaries was in the American grain. If you think that’s an exaggeration, consider an old military officer’s manual I still have in my possession. It’s vintage 1950, approved by that great American, General George C. Marshall Jr., the man most responsible for our country’s victory in World War II. It began with this reminder to the newly commissioned officer: “[O]n becoming an officer a man does not renounce any part of his fundamental character as an American citizen. He has simply signed on for the post-graduate course where one learns how to exercise authority in accordance with the spirit of liberty.” That may not be an easy thing to do, but the manual’s aim was to highlight the salutary tension between military authority and personal liberty that was the essence of the old citizen’s army. Those words were a sound antidote to government-issue authoritarianism and militarism—and they still are. Together we all need to do our bit, not as GI Joes and Janes, but as Citizen Joes and Janes, to put personal liberty and constitutional principles first. In the spirit of Ronald Reagan, who told Soviet leader Mikhail Gorbachev to “tear down this [Berlin] wall,” isn’t it time to begin to tear down the walls of Fortress America and shed our militarized mindsets? Future generations of citizens will thank us, if we have the courage to do so.